I qualified as a Speech and Language Therapist in 1981, and worked throughout London, including running a pre-school language unit in Islington. After gaining MSc in Human Communication from City University, I trained as a primary school teacher: working in Reception, Year 1, Year 4 and as a Special Needs Coordinator. I worked as an Advisory Teacher with Traveller children and their families, and was Head of Luton’s Traveller Education Support Service. 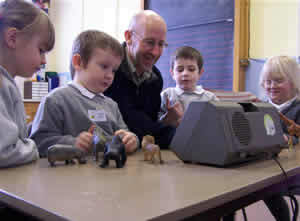 For three years I was Advisory Teacher for children with speech, language and communication needs in Luton, and was a consultant on a research project for the University Of London Institute of Education: looking at ways to improve the spoken language of young children in inner London schools. Between 2008 and 2010 I was an Early Language Consultant on the Every Child a Talker (ECaT) programme in Luton, Bedford and Thurrock. I spend my time writing about children’s language development, wellbeing and learning. My new book on language development, ‘Talking and Learning with Young Children’ was published by Sage in November 2015. My new book on mark making, early writing and language development was published by Lawrence Education/Yellow Door in February 2016. I’m currently working with Mine Conkbayir on a book on effective talk with young children from two to five years and another on children’s development and learning from birth to five years.